Evoke a sense of the Old World with this incredibly eye-catching round wall clock. 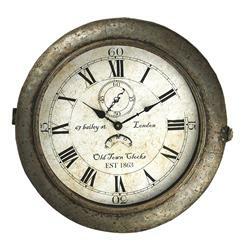 Made of galvanized steel with a rusty, distressed finish, the clock face features a screen printed Bailey Street London address, Roman and Arabic numerals, an aged look and appropriately-styled clock hands adding to the overall design. Offering vintage appeal, this battery-operated clock will keep today's time in the rustic or Industrial interior.